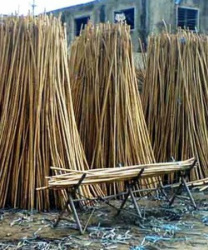 The material used for caning comes from the rattan vine which grows naturally in the tropical forests of Southeast Asia. The bark is peeled off and made into uniform strips to make a variety of sizes for weaving and binding. The cane, when new, is blond in color with some natural variations throughout, but darkens to a deep honey color with age and oxidation. Sheet Cane goes through an additional manufacturing step; the cane is pre-woven first by looms and then finished by hand. It is then shipped in large rolls that can be cut to the size required for replacement. 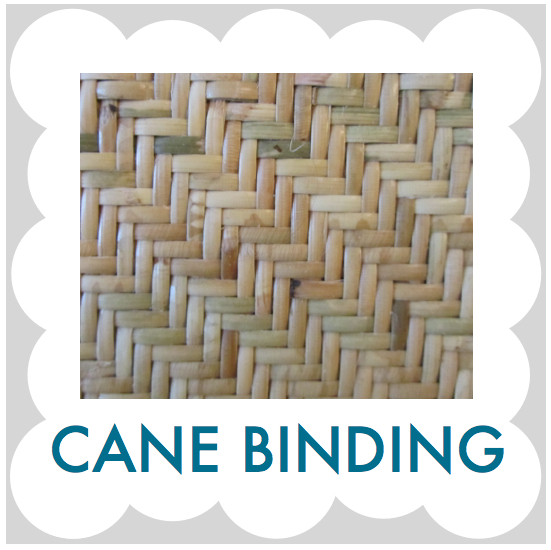 Check out the video below to see how cane is produced! Q: Why did the caning break? 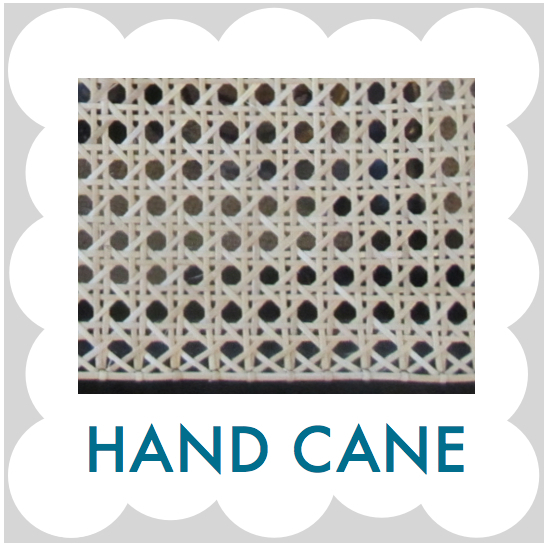 A: Caning, as with all woven furniture, ages and needs replaced with fresh materials from time to time. Maintenance is part of ownership of caned pieces just like getting a tune-up for your car. For the longest lifespan of your cane, follow use and care instructions- click on the "CARE" tab at the top of the page. Q: A couple of strands broke in the caning- can I have those strands replaced? A: No. When a caned panel fails it starts out as a few small breaks. Once enough of the strands are compromised someone will inevitably sit through the seat *pop*pop*pop* and you might be a little closer to the floor! I have clients that like to blame their spouses, but it is just the straw that breaks the camel's back. Strand replacement involves more than just the broken strands, it would only hope to achieve a temporary cosmetic fix, and would not make the caning structurally sound on seats or backs. I do not offer strand replacement. Q: If the seat is broken and the back isn't, do I need to have both replaced? A: No. I advise clients to only replace panels that are broken. Seats are much more common than backs to need replacement since they take much more weight and use. It is not uncommon for a back to last 2 or 3 times as long as a seat. Q: Can caning be stained? Q: I have a set of chairs, but not all of them are broken. Do I need to replace all the cane in the whole set? A: No, generally speaking just the broken panels need replacement, not the whole set. Cost of staining to match vs. cane replacement: Is it better to put money into staining the new cane to match the old cane -or- replacing the other old cane preemptively in which case all the cane would match and darken with age? Q: I would like to have the structure of my chair repaired, refinished, or re-painted. When should I do that? A: Most of the time it is best to do this BEFORE new weaving goes in. It is best to consult with both myself and the wood restoration specialist before starting. 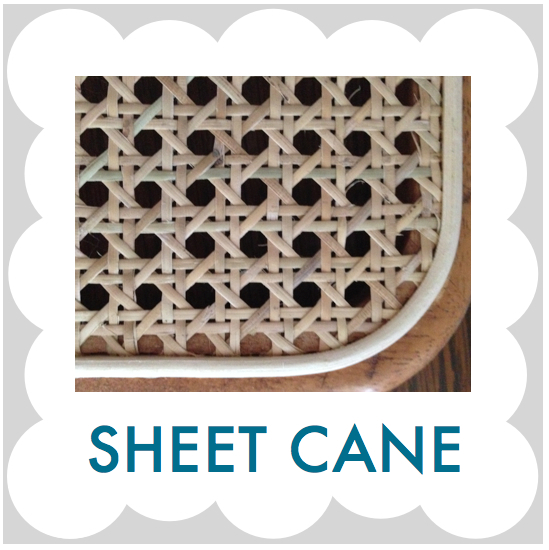 If you are having a Sheet Cane chair refinished or re-painted it is very important NOT to put any stain, sealant, polyurethane, paint, etc in the grove where the cane attaches to the wood. The grove must be left as plain, bare wood. If not, you will be paying extra for me to hand sand down the grove back to bare wood! This example was refinished correctly. Q: How long can I expect caning to last? A: There are many factors that can determine how long caning will last including amount of use, weight of the users, heat, humidity, dry air, placement in the home, seat vs. back, size of the panel, size of the weave, amount of abuse, etc... At the most frequent I have customers that bring their 2 kitchen chairs in for seat replacement every 5 years because they use them for every meal, using the computer, watching TV, paying bills... Then there are dining chair backs that are the original caning from 80+ years ago and everything in between. A general rule of thumb is 5-25 years. Always follow care guidelines to help prolong the life of your cane- click on the "CARE" tab at the top of the page.